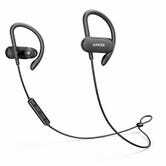 A lot of Anker’s earbuds have been popular with our audience, but the SoundBuds Curves are some of the sportiest member of the SoundBuds family, and are designed with active users in mind. Their ear wings ensure they stay put while you exercise, and an internal hydrophobic coating means your sweat won’t fry them. The real reason I suspect so many people have bought them though? 12.5 hours of battery life, which is basically unheard of in the space.